The system of sensors and control hardware that is used to point the observatory, maintain the stability, and provide data for determining where the observatory has been pointing is called the Pointing Control and Aspect Determination (PCAD) system. As Chandra detectors are essentially single-photon counters, an accurate post-facto history of the spacecraft pointing direction is sufficient to reconstruct an X-ray image. In this chapter we briefly discuss the hardware that comprises the PCAD system, how it is used, and its flight performance. Further information can be found on the Aspect Information web page within the main CXC Science web site (http://cxc.harvard.edu/cal/ASPECT/). Since data from the CSS, FSS, and ESA are not normally used in the processing of science observations, these are not discussed. However, in the unlikely event of a complete failure of the ACA, we would attempt to use CSS and FSS data. The aspect camera assembly (Figure 5.1) includes a sunshade ( ∼ 2.5 m long, ∼ 40 cm in diameter), a 11.2 cm, F/9 Ritchey-Chretien optical telescope, and light-sensitive CCD detectors. This assembly and its related components are mounted on the side of the HRMA. The camera's field of view is 1.4×1.4 deg and the sunshade is designed to protect the instrument from the light from the Sun, Earth, and Moon, with protection angles of 20, 6 and 6 deg, respectively. The aspect camera focal-plane detector is a 1024×1024 Tektronix CCD chip operating between -8°C and -16°C, with 24×24 micron (5′′×5′′) pixels, covering the spectral band between 4000 and 9000 Å. The optics of the camera are defocused (point source FWHM = 9 arcsec) to spread the star images over several CCD pixels to increase accuracy of the centering algorithm, and to reduce variation in the point response function over the field of view. There is a spare identical CCD chip, which can be illuminated by inserting a rotatable mirror. The ACA electronics track a small pixel region (either 4×4,6×6, or 8×8 pixels) around each fiducial light and star image. There are a total of eight such image slots available for tracking. Typically five guide stars and three fiducial lights (section 5.2.2) are tracked. The average background level is subtracted on-board, and image centroids are calculated by a weighted-mean algorithm. The image centroids and magnitudes are used on-board by the PCAD, and are also telemetered to the ground along with the raw pixel data. The spectral response of the CCD detector (Figure 5.2) is such that faint cool stars (e.g. type N0), with visual magnitudes much fainter than selected guide stars (i.e., 10.5 mag) can produce large numbers of counts. These so-called "spoiler stars" are effectively avoided in the mission planning stage. Figure 5.2: Spectral response of the ACA CCD. The same signal-to-noise is achieved for a V=11.7 magnitude N0 star as for a V=10 magnitude G0V star. Also shown are the spectra and the standard visual response for the two stars. Surrounding each of the SI detectors is a set of light emitting diodes, or "fiducial lights", which serve to register the SI focal plane laterally with respect to the ACA boresight. Each fiducial light produces a collimated beam at 635 nm which is imaged onto the ACA CCD via the RRC, the periscope, and the fiducial transfer mirror (Figure 5.3). Figure 5.3: Fiducial Transfer System. Fiducial lights are imaged onto the ACA CCD via the RRC, the periscope, and the fiducial transfer mirror. Two Inertial Reference Units (IRU) are located in the front of the observatory on the side of the HRMA. Each IRU contains two gyros, each of which measures an angular rate about 2 gyro axes. This gives a total of eight gyro channels. Data from four of the eight channels can be read out at one time. The gyros are arranged within the IRUs and the IRUs are oriented such that all 8 axes are in different directions and no three axes lie in the same plane. The gyros' output pulses represent incremental rotation angles. In high-rate mode, each pulse nominally represents 0.75′′, while in low-rate mode (used during all normal spacecraft operations) each pulse represents nominally 0.02′′. Control of the spacecraft momentum is required both for maneuvers, and to maintain stable attitude during science observations. Momentum control is primarily accomplished using 6 Teldix RDR-68 reaction wheel units mounted in a pyramidal configuration. During observing, with the spacecraft attitude constant apart from dither, external torques on the spacecraft (e.g. gravity gradient, magnetic) will cause a buildup of momentum in the RWA. Momentum is then unloaded by firing the MUPS and simultaneously spinning down the reaction wheels. The Chandra aspect system serves two primary purposes: on-board spacecraft pointing control and aspect determination, and post-facto ground aspect determination, used in X-ray image reconstruction and celestial location. The PCAD system has 9 operational modes (6 normal and 3 safe modes) which use different combinations of sensor inputs and control mechanisms to control the spacecraft and ensure its safety. These modes are described in Section 5.7.1. In the normal science pointing mode, the PCAD system uses sensor data from the ACA and IRUs, and control torques from the RWAs, to keep the target attitude within ∼ 30′′of the telescope boresight. This is done using a Kalman filter which optimally combines ACA star centroids (typically 5) and angular displacement data from two 2-axis gyroscopes. On short time scales ( ∼ sec) the spacecraft motion solution is dominated by the gyroscope data, while on longer timescales, it is the star centroids that determine the solution. Post-facto aspect determination is done on the ground and uses more sophisticated processing and better calibration data to produce a more accurate aspect solution. The suite of CXC tools to perform this processing is called the aspect pipeline. The key improvements over PCAD aspect come from better image centroiding and using Kalman smoothing (which uses all available data over the observation period - as opposed to historical data). In addition, the aspect pipeline folds in the position of the focal-plane instrument as determined by the fiducial light data. This section provides information about the aspect system performance, with an emphasis on parameters which impact science and/or observation planning. Table 5.1 provides a summary of results for four key aspect requirements (Sections 5.4.1 - 5.4.4) which originate in the Observatory Level-2 Project Requirements Document. In each case, the actual performance exceeds the requirements. Celestial location accuracy measures the absolute accuracy of Chandra X-ray source locations. Based on observations of 173 point sources detected within 2′ of the boresight and having accurately known coordinates, the 90% source location error circle has a radius of less than 0.79′′ overall, and less than 1.11′′ for each SI (Figure 5.4). Approximately 6.4% of sources are outside a 1′′ radius. The difference in astrometric accuracy for different SIs is a function of two factors: number of available data points for boresight calibration, and accuracy of the fiducial light SIM-Z placement (These values apply for sources within 3 arcmin of the aimpoint and with the SIM-Z at the nominal detector value. 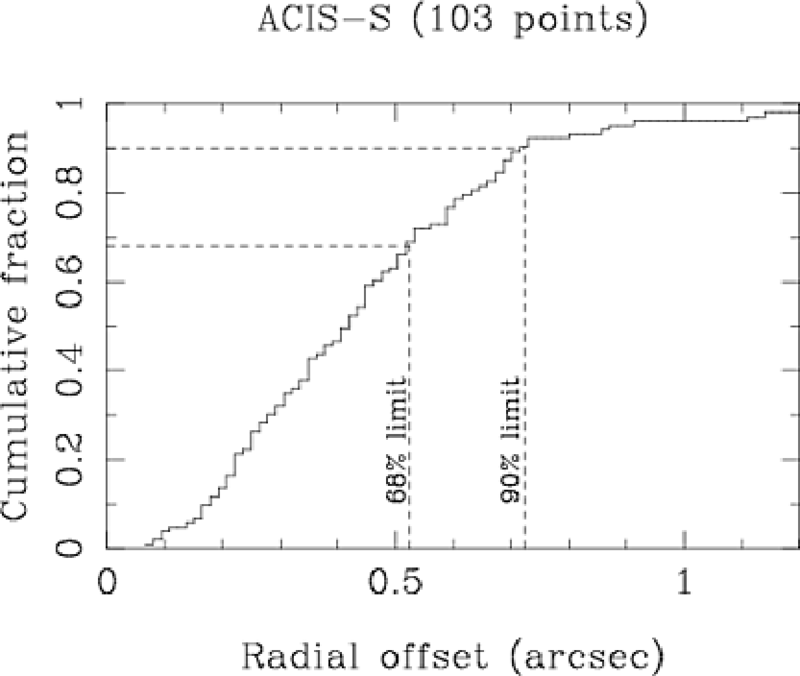 Observations on ACIS or HRC-S at large off-nominal SIM-Z can suffer additional residual aspect offsets of up to 0.5 arcsec and, for HRC-I, this can be up to 3 arcsec.). The plotted level of accuracy applies for observations that have been processed or reprocessed after 2013-Oct-27. Figure 5.4: Cumulative histogram of celestial accuracy for Chandra X-ray source locations for each SI using observations since Oct-2013. 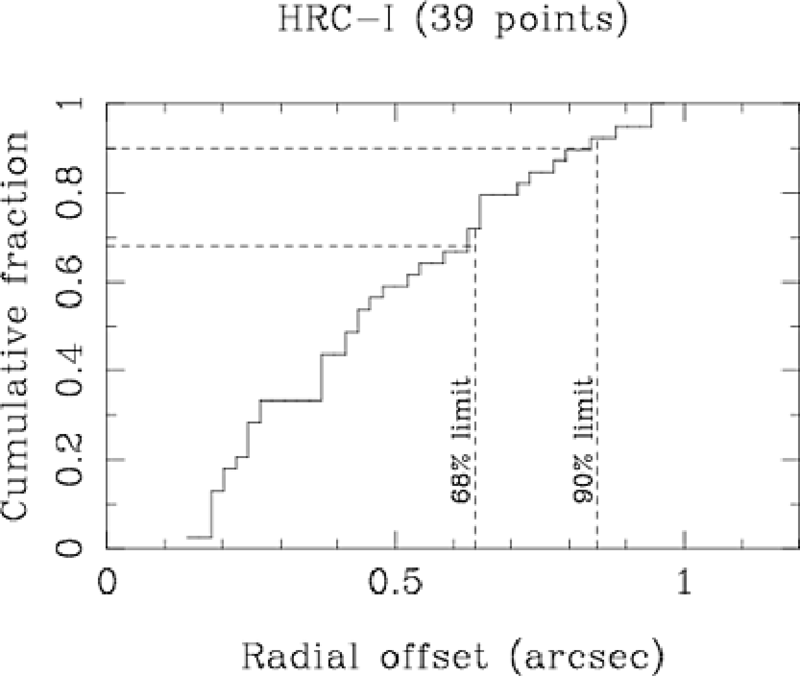 Radial offset is the distance in arcsec between the optical coordinate, typically from the Tycho-2 catalog, and the Chandra position. Image reconstruction performance measures the effective blurring of the X-ray PSF due to aspect reconstruction. A direct measure of this parameter can be made by determining the time-dependent jitter in the centroid coordinates of a fixed celestial source. Any error in the aspect solution will be manifested as an apparent wobble in the source location. Unfortunately this method has limitations. ACIS data are count-rate limited and we find only an upper limit: aspect reconstruction effectively convolves the HRMA PSF with a Gaussian having FWHM of less than 0.25′′. HRC observations can produce acceptably high count-rates, but the HRC photon positions (at the chip level) have systematic errors due to uncertainties in the HRC de-gap calibration (See "Position modeling, de-gap corrections, and event screening" in the References section of Chapter 7). These errors exactly mimic the expected dither-dependent signature of aspect reconstruction errors, so no such analysis with HRC data has been done. An indirect method of estimating aspect reconstruction blurring is to use the aspect solution to de-dither the ACA star images and measure the residual jitter. We have done this for 350 observations and find that 99% of the time the effective blurring is less than 0.20′′ (FWHM). Another component of the image reconstruction error is error in the registration of the SI and the ACA, specifically registration error due to drift in the apparent fiducial light positions used to establish this registration. Drift is caused by changes in the alignment of the periscope (see Figure 5.3). 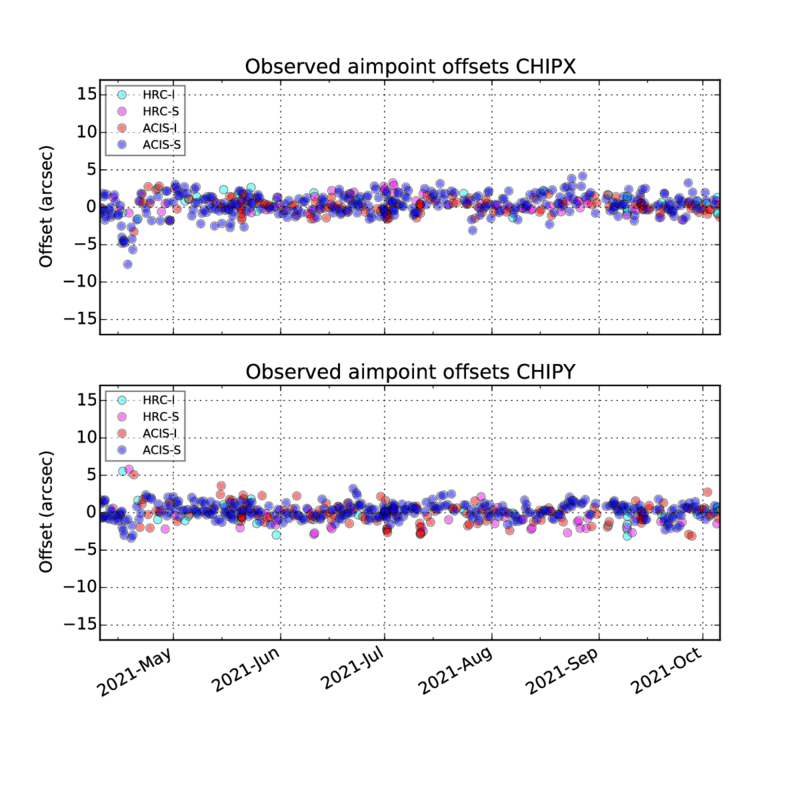 Registration error from this drift is reduced in ground aspect processing by a periscope drift correction applied in the aspect pipeline, but residual error of up to 0.5 arcsec may persist. 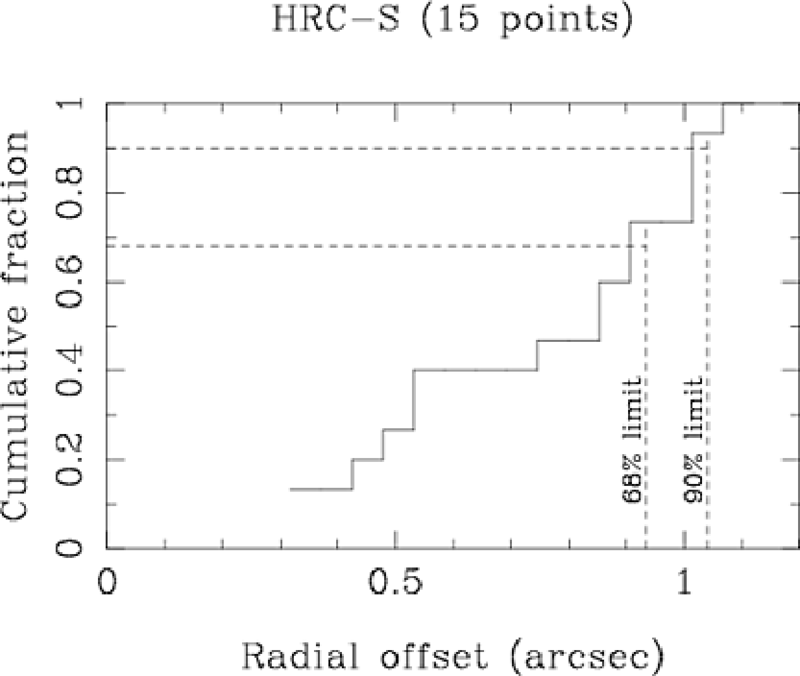 Users with long ( 50ks) observations of a bright, on-axis source, and a science goal that would benefit from sub-arcsec image reconstruction should see http://cxc.harvard.edu/ciao/ahelp/correct_periscope_drift.html for a correction tool. Absolute celestial pointing refers to the accuracy with which an X-ray source can be positioned at a specified location on the detector. This accuracy is determined by the precision to which the pointing system works as well as by the aimpoint stability and drift as discussed in the context of observation planning in Section 4.5. That section provides detailed information on the updated approach with default detector aimpoints and Table 4.5 and Figures 4.26-4.29 provide corresponding uncertainty boxes showing the precision to which a source can be placed on given detector. These figures include detector-specific padding for dither and address concerns about placement in CCD pixel space. This information is especially relevant for position-sensitive observations, for instance ACIS subarray or windowed observations. The absolute celestial pointing performance is dependent on the stability of the aspect camera optical axis because the spacecraft pointing and ultimately the aspect reconstruction is referenced to the ACA frame. In this performance context, the absolute celestial pointing accuracy is defined as the 99% radial offset of actual aimpoints from the planned aimpoint location. This quantifies the ability to position a target near the intended aimpoint. As of 2018-Oct the absolute celestial pointing accuracy is approximately 8′′. This is comprised of two observable components, mean absolute pointing error (±6 ′′, per-axis) and intra-observation drift (±2 ′′, per-axis). Plots of these two components may be seen in Figures 5.5 and 5.6 respectively. The ±2 ′′corresponds to the 90% peak-to-peak intra-observation drift of 4 ′′. Both the mean absolute pointing error and the intra-observation drift are correlated with thermal conditions on the spacecraft as the aspect camera optical axis alignment (relative to the HRMA alignment) is sensitive to the ACA housing temperature. Figure 5.5: Difference between observed and planned aimpoint in CHIPX and CHIPY directions for recent observations with planned aimpoints within 100 arcsec of the nominal aimpoint. Figure 5.6: Peak to peak aimpoint drift within individual science observations. This figure shows that total intra-observation drift (DY+DZ) up to 6′′ during observations is possible and, in rare cases, drift over 15′′ can occur. For further technical details about aimpoint monitoring and performance see http://cxc.cfa.harvard.edu/mta/ASPECT/aimpoint_mon/. The PCAD 10-second pointing stability performance is measured by calculating the RMS attitude control error (1-axis) within successive 10 second intervals. The attitude control error is simply the difference between the ideal (commanded) dither pattern and the actual measured attitude. Flight data show that 95% of the RMS error measurements are less than 0.12′′ (pitch) and 0.09′′ (yaw). Systematic offsets are not included in this term. Relative astrometric accuracy refers to the residual astrometric offsets assuming that the X-ray coordinates have been registered using well-characterized counterparts of several X-ray sources in the field. The most comprehensive dataset for measuring relative astrometry is based on the 900 ksec ACIS-I observation of the Orion Nebula. The members of COUP (Chandra Orion Ultradeep Project) have kindly provided us with a data file for over 1300 X-ray sources listing the offset from a 2MASS counterpart and the off-axis angle (Full details available in Getman et al. 2005, ApJS, 160, 319. In our analysis we include only the 1152 sources with more than 50 counts.). The left plot of Figure 5.7 shows a scatter plot of offset (arcsec) versus off-axis angle (arcmin). The right side of the figure shows cumulative histograms of the fraction of sources with relative offset below the specified value. This is broken into bins of off-axis angle as listed in the plot. 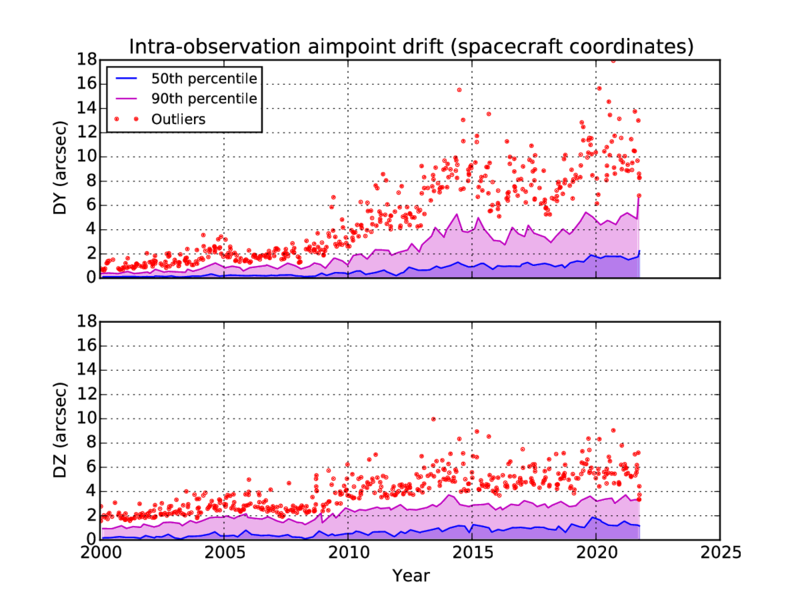 In the "on-axis" (0 - 2′) bin, 90% of sources have offsets less than 0.22′′. After, accounting for the ∼ 0.08′′ RMS uncertainty in 2MASS coordinates, this implies the intrinsic 90% limit is 0.15′′. See http://www.ipac.caltech.edu/2mass/releases/allsky/doc/. 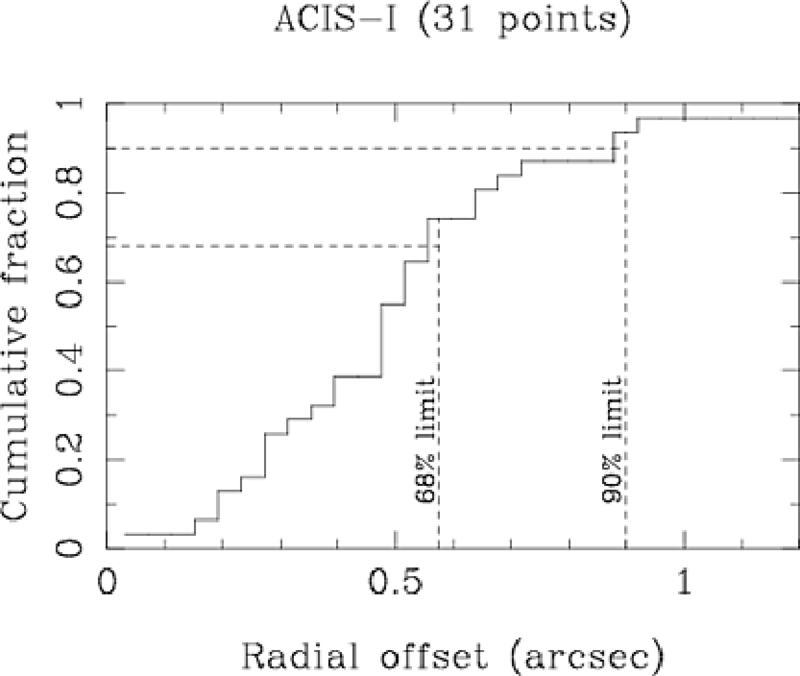 Figure 5.7: Left: scatter plot of offset (arcsec) versus off-axis angle (arcmin) for sources in the ultra-deep ACIS-I Orion observation. Right: cumulative histograms of the fraction of sources with relative offset below the specified value. As described in Section 5.8, in normal operations, the ACA is used to acquire and track stars and fiducial lights. Occasional failures in acquisition and difficulties in tracking are expected due to uncertainties in star position and magnitude, the presence of spoiler stars, CCD dark current noise (see Section 5.6.3), and other factors. Table 5.2 summarizes success statistics for star acquisition and tracking during the last year. A star is "successfully" tracked if it spends less than 5% of the observation in the loss of track state. Stars fainter than 10.3 mag are not used as guide stars. 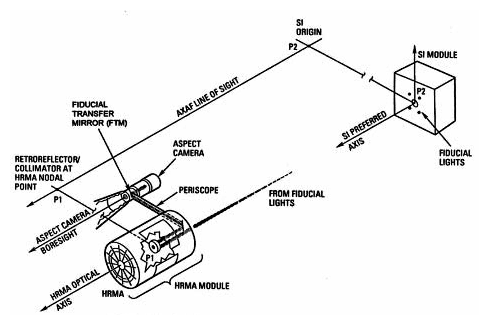 The Chandra aspect camera design is based on the Ball CT-601 star tracker, which was also used for the RXTE mission. The Chandra IRUs are nearly identical to the SKIRU V IRUs, some 70 of which have been built by the manufacturer - Kearfott. These IRUs are similar to those used on CGRO. IRU component testing at Kearfott provided calibration data necessary for accurate maneuvers and for deriving the aspect solution. The key parameters are the scale factor (arcsec/gyro pulse) and the drift rate stability parameters. The stability parameters specify how quickly the gyro readout random-walks away from the true angular displacement. These terms limit the aspect solution accuracy during gyro hold observations (Section 5.8.2). ACA component testing at Ball provided calibration data necessary for on-orbit pointing control and for post-facto ground processing. On-orbit, the ACA uses CCD gain factors, the plate scale factor, and temperature dependent field distortion coefficients to provide the control system with star positions and brightnesses. In ground processing, the CXC aspect pipeline makes use of those calibration data as well as CCD read noise, flat-field maps, dark current maps, and the camera PSF to accurately determine star positions. Orbital activation and checkout of the PCAD occurred during the first 30 or so days of the Chandra mission. During the first phase of OAC, before the HRMA sunshade door was opened, it was possible to use the ACA to observe the fiducial lights (period 1). After the sunshade door was opened it was possible to fully check the aspect camera using star light (period 2). During the Chandra science mission, aspect system components require on-orbit calibration to compensate for alignment or scale factor drifts, and to evaluate ACA CCD degradation due to cosmic radiation. The IRU-1 calibration coefficients were updated once (2002-Jul) based on analysis of PCAD data for 3105 maneuvers during the course of the mission. Following the swap to IRU-2 in 2003-Jul, new coefficients have been updated as needed (9 times between 2003 and 2017). The following ACA calibrations are performed, as-needed, based on the trending analyses of aspect solution data. Cosmic radiation damage will produce an increase in both the mean CCD dark current and the non-Gaussian tail of "warm" (damaged) pixels in the ACA CCD. This is illustrated in Figure 5.8, which shows the distribution of dark current shortly after launch and in 2018-July. The background non-uniformity caused by warm pixels (dark current > 100 e−/sec) is the main contributor to star centroiding error, though the effect is substantially reduced by code within the aspect pipeline which detects and removes most warm pixels. The fraction of pixels which appear to be warm during an observation is dependent on the underlying damage to the CCD and the CCD temperature during the observation. As the ACA thermoelectric cooler no longer has sufficient power margin to maintain the CCD at -19°C, temperatures fluctuate between -16°C and -8°C. The effective warm pixel fraction over this temperature range is expected to be between 19 and 34% during the next year. Dark current calibrations are performed approximately three times per year. Because the ACA has no shutter, a dark current calibration must be done with Chandra pointing at a star field which is as free from optical sources as possible. Five full-frame CCD maps are collected, each with slight pointing offsets to allow removal of field stars. The entire calibration procedure takes approximately 3 hours. The dark current of radiation damaged pixels is observed to fluctuate by factors of up to 25% on time scales of 1 to 50 ksec. This behavior was studied using a series of ACA monitor windows commanded during perigee passes in 2002. In 2008 and 2009, similar monitor window data were acquired and analyzed and the flickering pixel behavior was seen to be qualitatively unchanged from that seen in 2002. An important consequence of the flickering pixel phenomenon is that the dark current pixel values obtained during the dark current calibration may not be directly subtracted from observation pixel data in post-facto processing. Instead, users of monitor window data should use a warm pixel detection algorithm such as the one implemented in ground processing (Cresitello-Dittmar, M., Aldcroft, T. L., & Morris, D. 2001. On the Fly Bad Pixel Detection for the Chandra X-ray Observatory's Aspect Camera. ADASS X ASP Conf. Ser., Vol. 238, 439 http://www.adass.org/adass/proceedings/adass00/P1-22/). Radiation damage degrades the efficiency with which charge is transferred in the CCD by introducing dislocations in the semiconductor which trap electrons and prevent their transfer. The most important consequence is a "streaking" or "trailing" of star images along the readout column(s), which can introduce systematic centroid shifts. These shifts depend primarily on CCD transfer distance to the readout and star magnitude. The procedure for calibrating the mean CTI is to dither a faint star across the CCD quadrant boundary and observe the discontinuity in centroid (the CCD is divided electrically into four quadrants). In 2004, a total of 20 calibration observations were performed during perigee, each with a guide star dithering over a quadrant boundary. Despite significant concerns prior to launch, as well as notable CTI degradation in the ACIS front-illuminated chips, there is no evidence of increased CTI in the ACA CCD. The precise mapping from ACA CCD pixel position to angle relative to the ACA boresight is done with the "ACA field distortion polynomial". This includes plate scale factors up to third order as well as temperature-dependent terms. To verify that no mechanical shift in the ACA had occurred during launch, a field distortion calibration was performed during the orbital activation and checkout phase. The on-orbit calibration revealed no mechanical shift. Such a shift would have caused degraded celestial location accuracy. The calibration was done by observing a dense field of stars with the spacecraft in normal pointing mode. Two reference stars were observed continuously, while sets of 4 stars each were observed for 100 sec. The calibration was completed after observing 64 stars over the ACA field of view, taking roughly 60 minutes. There are currently no plans to repeat this on-orbit calibration. Instead, the field distortion coefficients are monitored by long-term trending of observed star positions relative to their expected positions. Contamination buildup on the CCD surface was predicted in pre-launch estimates to result in a mean throughput loss of 9% after 5 years on-orbit, though the calculation of this number has significant uncertainties. The buildup of contaminants is tracked by a trending analysis of magnitudes for stars which have been observed repeatedly throughout the mission (e.g. in the AR LAC field). To date, these trending analyses show no indication of contamination build-up. In the unlikely event that future contamination occurs and causes significant operational impact, we will consider "baking-out" the CCD on-orbit. In this procedure, the current to the CCD thermo-electric cooler is reversed so as to heat the device to approximately 30 C for a period of several hours. After bake-out the CCD would be returned to its nominal operating temperature of -19 C.
The PCAD system has 9 operational modes (6 normal and 3 safe) which use different combinations of sensor inputs and control mechanisms to control the spacecraft and ensure its safety. These modes are listed in Table 5.3. Normal science observations are carried out in Normal Pointing Mode (NPM), while slews between targets are done in Normal Maneuver Mode (NMM). Standby - - OBC commands to RWA, RCS, and SADA disabled, for initial deployment, subsystem checkout, etc. The ACA will meet performance requirements when the ACA line-of-sight is separated from: the Sun by 45 deg or more; the limb of the bright Earth by 10 deg or more; and the dark Earth or Moon by 6 deg or more. If these restrictions are violated, the star images may be swamped by scattered background light, with the result that added noise on the star position will exceed the 0.360′′ requirement (1-σ,1-axis). The important output data from the ACA are the scaled raw pixel intensities in regions (4×4, 6 ×6, or 8×8 pixel) centered on each of the star and fiducial light images. These data are placed in the engineering portion of the telemetry stream, which is normally allocated 8 kbit/sec. During an ACA dark current calibration (Section 5.6.3), Chandra utilizes a 512 kbit/sec telemetry mode in real-time contact to enable read-out of the entire CCD (1024 ×1024 pixels). The key data words in telemetry from the IRU are the 4 accumulated gyro counts (32 bits every 0.256 sec). After maneuvering at a rate of up to 2°/minute to a new celestial location using gyroscope data and the reaction wheels, Chandra begins the star acquisition sequence, a process which typically takes from 1 to 4 minutes. First, the OBC commands the ACA to search for up to 8 acquisition stars, which are selected to be as isolated from nearby stars as possible. The search region size is based on the expected uncertainty in attitude, which is a function of the angular size of the slew. If two or more acquisition stars are found, an attitude update is performed using the best (brightest) pair of stars. This provides pointing knowledge to 3′′ (3 σ per axis). Next, the guide star search begins. Depending on the particular star field configuration, the star selection algorithm may choose guide stars which are the same as the acquisition stars. In this case, the guide star acquisition time is somewhat reduced. When at least two guide stars have been acquired and pointing control errors converge, the on-board Kalman filtering is activated and the transition to Normal Point Mode is made, at which point sensing of the fiducial lights begins. The on-board PCAD system is flexible and allows several different Chandra science pointing scenarios, described in the following sections. The large majority of observations are performed using Normal Point Mode, with dither selected. In this case, the Chandra line-of-sight will be commanded through a Lissajous pattern. Dithering distributes photons over many detector elements (microchannel pores or CCD pixels) and serves several purposes: reduces uncertainty due to pixel to pixel variation in quantum efficiency (QE); allows sub-sampling of the image; and, in the case of the HRC, distributes the total exposure over many microchannel pores - useful since the QE of a pore degrades slowly with exposure to photons. The dither pattern parameters are amplitude, phase, and period for two axes. Each of the six parameters is separately commandable and differ for the two different instruments (See Chapters 6 and 7). The default values for these parameters are given in Table 5.4. Dither can be disabled for ACIS observations, while the minimum dither rate required to maintain the health of the HRC is 0.02′′/sec. The maximum dither rate, determined by PCAD stability requirements, is 0.22′′/sec. This mode is identical to NPM dither, but without the dither. Observations of moving solar system objects are done using a sequence of pointed observations, with the object moving through the field of view during each dwell period. Except in special circumstances, each pointing is selected so that the object remains within 5′ of the Chandra line-of-sight. Most solar system objects move slowly enough that a single pointed observation will suffice. Survey scans of regions larger than the instrument field of view are specified simply with a grid, i.e., a list of target coordinates giving the field centers. The fields can optionally overlap, depending on the science requirements of the survey. In special circumstances it will be necessary to perform observations without tracking guide stars. It may occur that a field has no suitable acquisition and guide stars, although this situation has not been encountered to date. A more likely situation is that a very bright object, such as the Earth or Moon, saturates the ACA CCD and precludes tracking stars. In this case, Chandra will first be maneuvered to a nearby pointing which has guide stars to establish fine attitude and a gyro bias estimate. A dwell time of approximately 20 minutes is needed to calibrate the bias estimate, which is the dominant term in the drift equation below. Chandra will then be maneuvered to the target. The default automatic transition to NPM will be disabled, and the spacecraft will hold on the target attitude in NMM. Ground test data for gyro noise parameters indicate worst case values of σu = 1.5×10−5 arcsec sec−3/2 and σv = 0.026 arcsec sec−1/2. Analysis of the residual Kalman filter bias estimate gives σb = 0.002 arcsec sec−1. This results in 1-σ angle drift errors of: 0.3′′ for 0.1 ksec; 2.2′′ for 1 ksec; 11′′ for 5 ksec; and 22′′ for 10 ksec. After a maximum of 3.6 ksec, Chandra will be maneuvered back to the nearby field with guide stars to re-establish fine attitude and update the gyro drift rate. The ACA has the capability to devote one of the eight image slots to "monitor" a particular sky location. This allows simultaneous optical photometry of a target in the ACA field of view. An optical source can be slightly fainter than the ACA guide star limit of mACA = 10.2 mag. The bright-end limit for monitor star photometry is mACA=6.2 mag. However, since there are a fixed number of image slots, devoting a slot to photometry instead of tracking a guide star results in a degradation of the image reconstruction and celestial location accuracy (Section 5.4). Using a monitor slot represents a 15 - 25% increase in the aspect image reconstruction RMS diameter, depending on the particular guide star configuration. 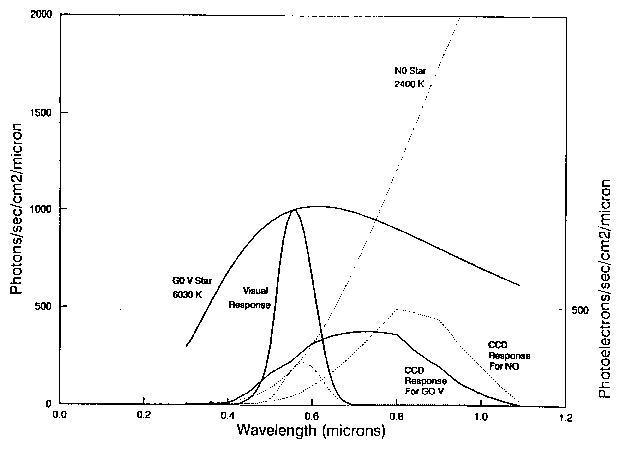 The photometric accuracy which can be achieved depends primarily on the star magnitude, integration time, CCD dark current, CCD read noise, sky background, and the CCD dark current uncertainty. 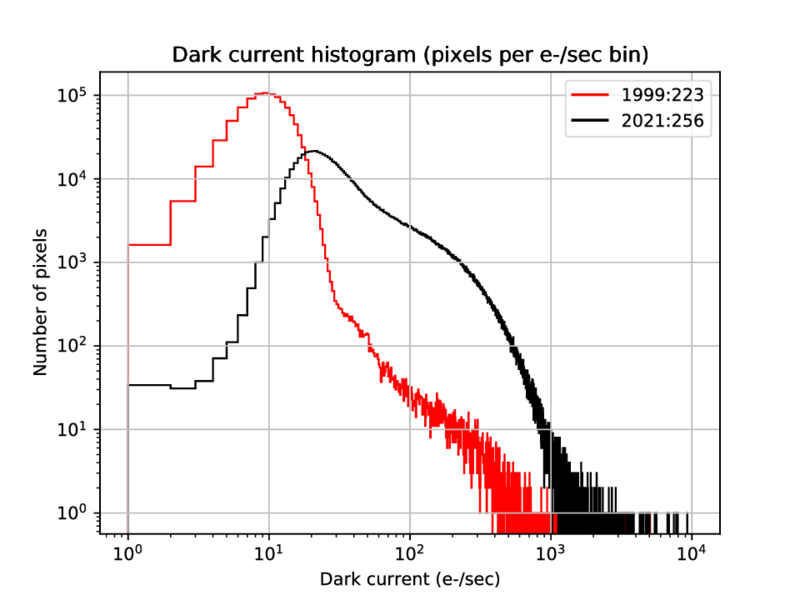 Dark current uncertainty ultimately limits the photometric accuracy at the faint end, and results from uncalibrated pixel-to-pixel changes in dark current due to radiation damage. This includes both changing background pixels as Chandra dithers, as well as intrinsic flickering in the radiation-damaged CCD pixels. This flickering, which occurs on time scales from less than 1 ksec to more than 10 ksec, poses fundamental problems for accurate photometry since the background dark current is a strong random function of time. With straightforward data processing, the noise introduced by the dark current variations (both spatial and temporal) is approximately 1100 e-/sec. A star with an ACA magnitude of 10.5 mag produces about 4400 e-/sec, giving a S/N of 4.0. This represents the practical faint limit for ACA monitor star photometry. Somewhat improved S/N could be obtained with a more sophisticated analysis which tracks the time-dependent dark current of each pixel. Users interested in processing ACA monitor window data are advised to contact the CXC HelpDesk (http://cxc.harvard.edu/helpdesk/) for assistance. The data products which are produced by the aspect solution pipeline are listed in Table 5.5. Key data elements include: IRU accumulated counts; raw pixel data for 8 images; observed magnitudes, pixel positions of the aspect stars and fiducial lights versus time; and aspect solution versus time. The star data are used to determine the RA, Dec, and roll (and corresponding uncertainties) of the HRMA axis as a function of time. The fid light images are used to track any drift of the SIM away from the nominal position. One cause of such drift is thermal warping of the optical bench assembly. The Kalman filtering routines also calculate an optimal estimate of the gyro bias rate as a function of time. The Aspect system uses the AGASC (AXAF Guide and Aspect Star Catalog) version 1.7. Further information about the AGASC, as well as access to catalog data, can be found on the CXC AGASC web page http://cxc.harvard.edu/agasc). The AGASC was prepared by the CXC Mission Planning and Operations & Science Support groups, and is a compilation of the Hubble Guide Star Catalog, the Positions and Proper Motion Catalog and the Tycho Output Catalog.